When Bharatanatyam is learnt, many dancers eventually see themselves as carriers of an ancient tradition that has been preserved by dancers for generations and believe it to be their duty to pass it on in its pristine form to the future generation of dancers. 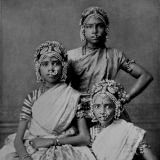 In the realm of dance education, there is merely a mention of 'devadasis', and this mention often leads to a restricted knowledge that devadasis were temple dancers who performed many years ago. It is also widely known (its even mentioned on Wikipedia) that scholars like E. Krishna Iyer and dancers like Rukmini Devi Arundale saved the dance by teaching it to the upper classes after its reputation had fallen along with the falling reputation of the devadasis. In a dance class, theory is not given as much importance as practice. Moreover, theory to do with dance usually comprises of discussions on the sanskritic texts on dance and drama, regarding the philosophies behind the several sanskritic traditions surrounding dance, or attributes of an ideal dancer - the geometry and symmetry of a dancer's face and body. Some dancers are privileged to have been taught in detail about the ashtanayikas and the navarasas. The knowledge passed on, therefore, is theoretical in the sense that it is a study of some of the ancient texts that refer to dance and drama. Of course, these are important for enriching any dancer's knowledge about Bharatanatyam. But the knowledge about Bharatanatyam cannot be nearly close to wholesome if its history is not taught, if dancers are not made aware of the socio-political surroundings in which the dance has survived over the centuries. As I entered my twenties, I found words like 'devadasi', 'sadir', 'dasi attam', 'revival', 'colonialism', 'elite', 'nationalism' and 'middle class' splattered across the pages that I religiously read. Through academic papers written by Janet O'Shea, Avanti Meduri, Chandralekha, Matthew Harp Allen, Anne-Marie Gaston and so on, I understood better, the turbulent side to the history of Bharatanatyam that hadn't been taught to me as an integral part of my dance education. I understood more deeply, the changes that the dance form underwent in content and style, and the implications of caste and class on Bharatanatyam. Moreover, I read that the name itself was a revivalist ploy to re-invent the dance to suit a post-colonial, nationalist middle-class. My master's thesis was a result of all that reading and research. In many ways, my thesis became a starting point to publicly and academically articulate my questions and concerns about dance and the systems in place within it. And in a wider sense, it helped to deepen my understanding about classical forms of all kinds in India. Recently, I was reading an article by P. Ragaviah Charry (Bharatanatyam: A Reader, Oxford University Press, 2010). His article about the devadasis was written in 1806. Curiously, I found the term 'Bharata Nateya' in it. This shook my recently consolidated belief that 'Sadir' was renamed Bharatanatyam during the early 1900s in order to transform the devadasi dance form into a nationalist dance for the middle classes to be able to take pride in. While most of my research did not contradict his article - the other issues I'd highlighted regarding caste, class, the guru-shishya parampara, and the conflict that I believed arose from the spatial shift from temple to theatre - were still valid. But this one error in my thesis regarding the name was bothersome. I have not yet been able to resolve this. There are arguably plausible stories about the name 'Bharatanatyam' originating from bhava (Bha), raga (ra), and talam (ta), but as far as I know, only speculation backs this theory. Other scholars have argued that the dance form was named after 'Bharatamuni', the author of the Natyashashtra, although Richard Schrechner has implied that Bharatamuni himself was myth, 'most likely a pseudonym for a collective oral tradition' (Schrechner, Richard. Rasaaesthetics. The Drama Review, 1988, Vol. 45, No.3) while others have questioned why, despite the existence of several other dance forms of equal richness and value, only this form was bestowed the honour of being named after the author of the Natyashashtra. These are pertinent enough points to question the foundations of these speculations and even fuels the theory about the creation of a 'national dance' in post-colonial India. Yet, Charry's article seems to prove that Bharatanatyam was not a name invented in the post-colonial nationalist era. So, when did the name change? Arguably this is not a very important query, but I think it is an important question to ask precisely because of the proven monumental role that the socio-political atmosphere has played in changing the style, form and content of the dance form. 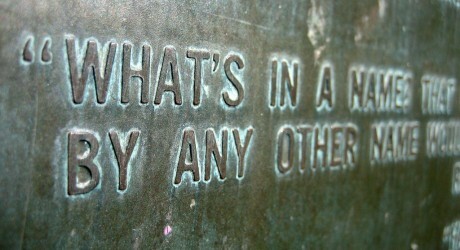 Given that, it might be worth exploring this question. There must be a distinctive and illuminating reason for why the name was changed when it was. Under what circumstances it was changed, and by whom, will certainly shed light on the reasons for the change in name, and its implications on the dance form itself. I hope to find the answer(s) to this question, because I really believe that it will help in the understanding of Bharatanatyam's past, and therefore its present and future. Fascinating. For all that Indians like to preen themselves on their history it is ridiculous how little is known about certain things. The bhava (Bha), raga (ra), and talam (ta)derivation seems like the sort of spurious back-formation that often plagues attempts to invent a preferred version of a historical past (Robert Graves is full of this sort of stuff even if I am somehow in sympathy with him). Very nice :-) Didn't know any of this! Thanks, JP. Glad this post caught your attention. Its very interesting that you talk about a preferred version of a historical past. I believe precisely this HAS happened regarding dance. We have reinvented tradition. I talk about it in my thesis as well. Have you read Hobsbawm's and Ranger's edited book 'The Invention of Tradition'? It's a great read for this. Also, the anthropologist CJ Fuller talks about reinvented pasts in his book 'The Camphor Flame'. All really interesting reads. I referred to them extensively in my thesis. Anupam, I'm happy to have told you something you didn't know. :) Keep reading! Interesting. See the second article in this link.